I visited Greenwich today (October 9, 2010). It falls in Zone 2 & 3 on the SE on London and can easily be reached by DLR trains /number of buses. Greenwich is pronounced as gren-itch and is famously known for Greenwich Mean Time (GMT). Basically, there are 4 major attractions from a tourist point of view - Greenwich Park, Royal Observatory and National Maritime Museum. And one can’t miss the famous Greenwich Market while visiting Greenwich. It is also a point of Prime meridian where longitude is ‘0’ . We all know Greenwich Mean Time (GMT) . GMT is a term originally referring to mean solar time at the Royal Observatory in Greenwich and is commonly used in practice to refer to Coordinated Universal Time (UTC) when this is viewed as a time zone .To help others synchronize their clocks to GMT, a time ball was installed by Astronomer Royal John Pond in 1833. It still drops daily to mark the exact moment of 1 p.m. (13:00) year round. The observatory at Royal actually was used till 1954 to calculate the time. 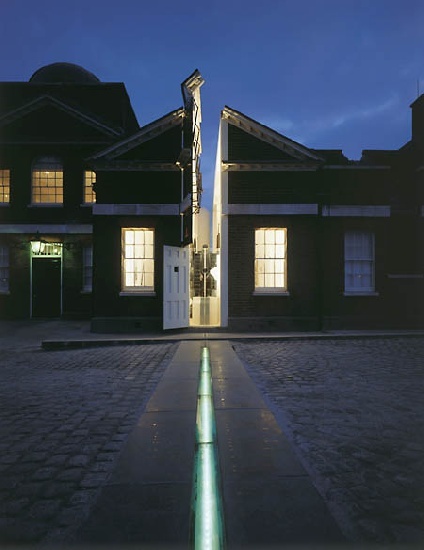 The scientific work of the observatory has since been relocated elsewhere in stages in the first half of the 20th century, and the Greenwich site is now maintained as a tourist attraction. The Royal Observatory is located in the sprawling Greenwich Park which covers 73 hectares (183 acres) and is the oldest enclosed Royal Park. It is situated on a hil ltop with impressive views across the River Thames to the Docklands and the City of London, between Blackheath and the River Thames. Greenwich Park provides a setting for several historic buildings, including the Old Royal Observatory, the Royal Naval College, the National Maritime Museum and the Queen's House. Greenwich Park will host the Equestrian and Modern Pentathlon events during the London Olympics 2011. Crowds of 23,000 in the main arena and more in the park will be able to enjoy the competitions. National Maritime - The National Maritime Museum (NMM) was opened to the public by King George VI on 27 April 1937. It includes the 17th-century Queen's House and, from the 1950s, the Royal Observatory, Greenwich. The Museum has the most important holdings in the world on the history of Britain at sea, including maritime art (both British and 17th-century Dutch), cartography, manuscripts including official public records, ship models and plans, scientific and navigational instruments, time-keeping and astronomy (based at the Observatory), and in many other categories. It has the world's largest maritime historical reference library (100,000 volumes) including books dating back to the 15th century. The Museum is also unique in the architectural importance of its main buildings, the Queen's House in particular being the keystone of the historic park-and-palace landscape of 'Maritime Greenwich', which was inscribed as a UNESCO World Heritage Site in 1997. Gr eenwich market: There has been a market at Greenwich since the 14th century, but the history of the present market dates from 1700 when a charter to run two markets, on Wednesdays and Saturdays, was assigned by Lord Romney to the Commissioners of Greenwich Hospital for 1000 years. The 1980s saw a revival in the fortunes of Greenwich Market; the first arts and crafts market opened on 14th May 1985, inspired by the flourishing example of Camden Lock, and from 1987 the shops around the markets periphery were let to new tenants largely in the craft business. It is an interesting market to explore artifacts, paintings, books and eateries. Infact. I could get Simon Singh's "The Code Book" in the market which I had been looking fo r a long time and this was one of the high points of my visit today. In 1997, Maritime Greenwich was added to the list of World Heritage Sites, for the concentration and quality of buildings of historic and architectural interest. These can be divided into the group of buildings along the riverfront, Greenwich park and the Georgian and Victorian town centre. In recognition of the suburb's astronomical links, Asteroid 2830 has been named 'Greenwich'. As one stands on the Observatory , one gets a breathtaking view of the city including Thames and Millennium Dome which incidentally is the World's biggest Dome build on the Meridian Line in Greenwich.